In Spring Semester 2019, the Minor Course of Science and Technology for Global Leaders offer six classes from Innovation Creation Fundamental Courses, and six classes from Global Leader Development Courses (one from English Courses, one from Leadership Courses, two from Doctoral Program LA, and two from Others). The classes are available for all master’s & doctoral students in Humanities and Sciences Program. Undergraduate students can also attend. * “Essential Ⅰ” is designed to learn fundamentals in each field and has no prerequisites. 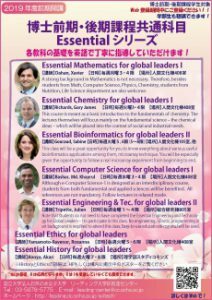 * “Essential Ⅱ” is designed to expand and deepen the knowledge based on “Essential Ⅰ”, but “Essential Ⅰ” is not a prerequisite for this class.